"Evansville" redirects here. For other uses, see Evansville (disambiguation). Evansville is a city and the county seat of Vanderburgh County, Indiana, United States. The population was 117,429 at the 2010 census, making it the state's third-most populous city after Indianapolis and Fort Wayne, the largest city in Southern Indiana, and the 232nd-most populous city in the United States. 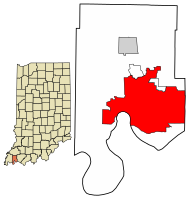 It is the commercial, medical, and cultural hub of Southwestern Indiana and the Illinois-Indiana-Kentucky tri-state area, home to over 911,000 people. The 38th parallel crosses the north side of the city and is marked on Interstate 69. Location of Evansville in Vanderburgh County, Indiana. Situated on an oxbow in the Ohio River, the city is often referred to as the "Crescent Valley" or "River City". As a testament to the Ohio's grandeur, early French explorers named it La Belle Rivière ("The Beautiful River"). The area has been inhabited by various indigenous cultures for millennia, dating back at least 10,000 years. Angel Mounds was a permanent settlement of the Mississippian culture from 1000 AD to around 1400 AD. The European-American city was founded in 1812. Four NYSE companies (Accuride, Berry Global, OneMain Financial, and Vectren) are headquartered in Evansville, along with the global operations center for NYSE company Mead Johnson. Three other companies traded on the NASDAQ (Escalade, Old National Bank, and Shoe Carnival) are also headquartered in Evansville. The city is home to public and private enterprise in many areas, as Evansville serves as the region's economic hub. A tourist destination, Evansville is home to Tropicana Evansville, the state's first casino; Mesker Park Zoo and Botanic Garden, one of the state's oldest and largest zoos; and sports tourism industry. The city has several educational institutions. The University of Evansville is a small private school on the city's east side, while the University of Southern Indiana is a larger public institution just outside the city's westside limits. The Indiana University School of Medicine also maintains a campus in Evansville. Other local educational institutions include the nationally ranked Signature School and the Evansville Vanderburgh Public Library. In 2008, Evansville was voted the best city in the country in which "to live, work, and play" by the readers of Kiplinger, and in 2009 as the 11th best. There was a continuous human presence in the area that became Evansville from at least 8,000 BC by Paleo-Indians. Archaeologists have identified several archaic and ancient sites in and near Evansville, with the most complex at Angel Mounds. This was built and occupied from about 900 A.D. to about 1600 A.D., just before the arrival of Europeans to North America. Following the abandonment of Angel Mounds between the years 1400 and 1450, tribes of the historic Miami, Shawnee, Piankeshaw, Wyandot, Delaware and other Native American peoples were known to be in the area. French hunters and trappers were among the first Europeans to come to the area, using Vincennes as a base of operations for fur trading. The land encompassing Evansville was formally relinquished by the Delaware in 1805 to General William Henry Harrison, then governor of the Indiana Territory. On March 27, 1812, Hugh McGary Jr. purchased about 441 acres and named it "McGary's Landing". In 1814, to attract more people, McGary renamed his village "Evansville" in honor of Colonel Robert Morgan Evans. Evansville incorporated in 1817 and was designated as the county seat on January 7, 1818. The county was named for Henry Vanderburgh, a deceased chief judge of the Indiana Territorial Supreme Court. Evansville became a thriving commercial town with a river trade, and the town began to expand outside of its original footprint. Evansville's west side was for many years cut off from the city's main part by Pigeon Creek and the factories that developed along it, making the creek an industrial corridor. The land comprising the former town of Lamasco was platted in 1837 and was annexed in 1870. Evansville's economy received a boost in the early 1830s when Indiana unveiled plans to build the longest canal in the world, a 400-mile ditch to connect the Great Lakes at Toledo, Ohio with the inland rivers at Evansville. The project was intended to open Indiana to commerce and improve transportation from New Orleans to New York City. The project bankrupted the state and was so poorly engineered that it would not hold water. By the time the Wabash and Erie Canal was finished in 1853, Evansville's first railroad, Evansville & Crawfordsville Railroad, was opened to Terre Haute. [incomplete short citation] The expansion of railroads in this territory had made the canal obsolete. Only two flat barges ever made the entire trip. The canal basin at Fifth and Court street in downtown Evansville became the site of a new courthouse in 1891. The era of Evansville's greatest growth occurred in the second half of the 19th century, following the disruptions of the Civil War. The city was a major stop for steamboats along the Ohio River, and it was the home port for a number of companies engaged in trade via the river. Coal mining, manufacturing, and hardwood lumber was a major source of economic activity. By 1900 Evansville was one of the world's largest hardwood furniture centers, with 41 factories employing approximately 2,000 workers. Railroads eventually became more important and in 1887 the L&N Railroad constructed a bridge across the Ohio River. along with a major rail yard southwest of Evansville in Howell, which was annexed in 1916 and completed the city's counterclockwise march around the horseshoe bend. Throughout this period Evansville's main ethnic groups consisted of Protestant Scotch-Irish from the South, Catholic Irish coming for canal or railroad work, New England businessmen, Germans fleeing Europe after the 1848 revolutions, and freedmen from Western Kentucky. By the U.S. census of 1890 Evansville ranked as the 56th-largest urban area in the United States, but it was surpassed in population by other cities in the early 1900s. As the new century began, the city continued to develop to its eastern areas. Manufacturing also took off, particularly in the automobile and refrigeration industries. The Graham brothers, Ray, Robert, and Joseph, got their start with a successful glass factory in Evansville. After they sold it in 1907, the glass factory became Libbey-Owens-Ford. In 1916, seeing the need for a dependable truck, the Graham brothers entered the truck chassis business. Evansville was home to Graham Brothers Trucks from then until 1929. The dependability of Graham trucks was due in part to their use of Torbensen internal gear drive rear axels. In 1921, after the death of both Dodge brothers, Graham Brothers started selling 1.5 ton pickups through Dodge dealers. (Dodge did not manufacture trucks at the time). These vehicles had Graham chassis and some Dodge parts. Dodge Brothers bought a controlling interest in Graham Brothers in 1925, picking up the rest in 1926. The city saw exponential growth in the early twentieth century with the production of lumber and the manufacturing of furniture. By 1920, Evansville had more than two dozen furniture companies. In the decades of the 1920s and 1930s, city leaders attempted to improve Evansville's transportation position and successfully lobbied to be on the Chicago-to-Miami "Dixie Bee Highway" (U.S. Highway 41). A bridge was built across the Ohio River in 1932 and in that same decade steps were taken to develop an airport. But the Ohio River flood of 1937 covered 500 city blocks in Evansville, resulting in a major crisis. With steamboats less necessary to the local economy, city and federal officials responded to the flood and its destruction by constructing more and higher levees: construction that penned and hid the Ohio River behind a barrier of earthen berms and concrete walls. During World War II, Evansville was a major center of industrial production which helped revive the regional economy after the Great Depression. A huge, 45-acre shipyard complex was constructed on the riverfront east of St. Joseph Avenue for the production of oceangoing LSTs (Landing Ship-Tanks). The Evansville Shipyard was the nation's largest inland producer of LSTs. The Plymouth factory was converted into a plant which turned out "bullets by the billions," and many other companies switched over to the manufacture of war material. In 1942 the city acquired a factory adjacent to the airport north of the city for the manufacture of the P-47 Thunderbolt fighter aircraft, known as the P-47Ds. Evansville produced a total 6,242 P-47s, almost half of the P47s made nationally during the war. After the war, Evansville's manufacturing base of automobiles, household appliances, and farm equipment benefited from growing post-war demand. A growing housing demand also caused residential development to leap north and east of the city. However, between 1955 and 1963, a nationwide recession hit Evansville. Among other closures, Servel (which produced refrigerators) went out of business and Chrysler ended its local operations. The economy was saved from near total collapse by 28 businesses that moved into the area, including Whirlpool, Alcoa, and General Electric. During the final third of the 20th century, Evansville became the hub of the tri-state region's commercial, medical, and service industries. A 1990s economic spurt was fueled by the growth of the University of Southern Indiana. The arrival of giant Toyota and AK Steel manufacturing plants, as well as Tropicana Evansville, Indiana's first gaming boat, also contributed to the growth of jobs. As the twenty-first century began, Evansville continued in a steady pace of economic diversification and stability. The Evansville Metropolitan Area, the 142nd largest in the United States, includes four Indiana counties (Gibson, Posey, Vanderburgh, and Warrick) and two Kentucky counties (Henderson, and Webster). The metropolitan area does not include Owensboro, Kentucky, which is an adjacent metropolitan area about 30 miles (48 km) southeast of Evansville. This area is sometimes referred to as "Kentuckiana", although the area is usually referred to as the "Tri-State" by the local media. Evansville is at 37°58'38" north, 87°33'2" west (37.977166, −87.550566). According to the 2010 census, Evansville has an area of 44.622 square miles (115.57 km2), of which 44.15 square miles (114.35 km2) (or 98.94%) is land and 0.472 square miles (1.22 km2) (or 1.06%) is water. The city's southern boundary lies on an oxbow in the Ohio River. Most of the city lies in a shallow valley surrounded by low rolling hills. The city's west side is built on these rolling hills and is home to Burdette Park, Mesker Amphitheatre, and Mesker Park Zoo. The eastern portion developed in the valley and is protected by a series of levees that closely follow the path of Interstate 69. Notable landmarks on the east side are the 240-acre (1.0 km2) Wesselman Woods Nature Preserve and the Angel Mounds State Historic Site, just southeast of Evansville, between Evansville and Newburgh. Evansville's original downtown plat was made on about 200 acres, with streets running parallel to the river from northwest to southeast. Other streets nearby were later laid out on the cardinal points, due north-south, and east-west. Thus, anyone entering or leaving downtown finds the street makes a confusing oblique-angle turn in one direction or another. In the 1970s, the city suffered from problems such as decreased economic activity and suburban flight, but city-sponsored revitalization has improved downtown conditions. The business district and riverfront feature gambling, restaurants, bars, and shops that attract tens of thousands of visitors each year. Although much of the outer city's architecture is typical suburban design, the city's downtown district retains early twentieth-century architecture. A few blocks east of the main business district is the Riverside district, featuring tree-lined brick streets full of turn of the twentieth-century homes. The Reitz Home Museum is one of the finest examples of French Second Empire architecture in the United States. Other homes nearby feature similar character and design and include Italianate, Colonial Revival, and Renaissance Revival styles. Evansville has thirteen neighborhoods that have qualified as historic districts and are listed on the National Register of Historic Places. Evansville has a humid subtropical climate (Köppen Cfa), and straddles the border between USDA Plant Hardiness Zones 6b and 7a. Summers are hot and humid, winters are cool to mild. Average temperatures range from 32.5 °F (0.3 °C) in January to 78.0 °F (25.6 °C) in July. Annual precipitation averages 45.3 inches (1,150 mm), including an average seasonal snowfall of 11.8 inches (30 cm). Evansville winters can range from just 0.5 in (1.3 cm) of snowfall in 2011–12, up to 37.9 in (96 cm) in 1969–70. On average, there are 41 days annually with a maximum temperature of 90 °F (32 °C) or above and 17 days with a maximum at or below freezing; the mean first and last freeze dates are October 26 and April 7, resulting in a frost-free period of 201 days. Extreme temperatures range from −23 °F (−31 °C) on February 2, 1951 up to 111 °F (44 °C) on July 28, 1930; the record cold maximum of −3 °F (−19 °C) was set on January 20, 1985 and December 22, 1989, while, conversely, the record warm minimum of 82 °F (28 °C) was last reached July 8, 1980. In August 2018 the mayor of Evansville sent a letter to the Ohio River Valley Water Sanitation Commission (ORVWSO) opposing a proposal to eliminate pollution control standards for the Ohio River. Evansville is located downstream from the river's origin. Sources of pollution that effect water quality include agricultural runoff, raw sewage discharges from combined sewage overflows, and toxic chemicals released by companies with water pollution permits. The State of Indiana issues a fish consumption advisory for fish from the Ohio River based on PCB contamination. The recommended consumption limit for most fish, including carp, striped bass and flathead catfish is no more than 8 oz. per month, but for channel catfish, the recommendation is only 8oz every two months. Six very large coal-fired power plant complexes operate within 30 miles of Evansville: Indiana-Michigan Power's Rockport Generating Station, near Rockport, Indiana, Indianapolis Power & Light's Petersburg Generating Station near Petersburg, and Duke Energy's Gibson Generating Station near Mount Carmel. Evansville-Based Vectren operates the other two; the A. B. Brown Generating Station, located just west of Evansville, and Warrick County Generating Station/F. B. Culley Generating Station complex, east of Newburgh, largely owned by Alcoa. In addition, another coal fired power plant complex, The R.D. Green Station, operated by Touchstone Energy's Big Rivers Electric, exists 20 miles south of Evansville, near Sebree, Kentucky. The levels of fine particles in the air in Vanderburgh County were almost as high as in Manhattan, New York City. As of the census of 2010, there were 117,429 people, 50,588 households, and 28,085 families residing in the city. The population density was 2,659.8 inhabitants per square mile (1,027.0/km2). There were 57,799 housing units at an average density of 1,309.2 per square mile (505.5/km2). The racial makeup of the city was 82.0% White, 12.6% African American, 0.3% Native American, 1.0% Asian, 0.1% Pacific Islander, 1.3% from other races, and 2.8% from two or more races. Hispanic or Latino of any race were 2.6% of the population. Median household income was $36,330 (2016), with the per capita income being $21,368 (2016). Poverty level was 21.7%. The median age in the city was 36.5 years. 22.1% of residents were under the age of 18; 11.7% were between the ages of 18 and 24; 26% were from 25 to 44; 25.8% were from 45 to 64, and 14.4% were 65 years of age or older. The gender makeup of the city was 48.1% male and 51.9% female. Evansville is the regional center for a large trade area in Indiana, Kentucky, and Illinois. The largest industry sectors in size in Evansville are healthcare, finance, education, and manufacturing. Other major industries by employment are energy, warehousing and distribution, and retail. Corporate headquarters in Evansville include Accuride, Ameriqual Group, Anchor Industries, Atlas Van Lines, Berry Global, Evana Tool & Engineering, Karges Furniture, Koch Enterprises, Lewis Bakeries, Metronet, Old National Bank, Red Spot Paint & Varnish, Shoe Carnival, OneMain Financial, Traylor Brothers, and Vectren. Major manufacturing operations near the city include Alcoa in Newburgh, AK Steel in Rockport, SABIC in Mount Vernon, and Toyota in Princeton. Other major employers with workforces of 500 or more in the area include AT&T, Bristol-Myers Squibb, SRG Global, Industrial Contractors, Mead Johnson, Peabody Energy, PGW Pittsburgh Glass, T.J. Maxx, and Tropicana Evansville. Evansville has emerged as the tri-state's major center for the healthcare and medical sciences industries. Deaconess Hospital and St. Vincent Evansville (formerly St. Mary's Hospital and Medical Center), along with the Deaconess Gateway and Women's Hospital just outside city limits, provide the anchors for a health care system that are among the region's largest employers. Evansville is also a regional energy hub due to the headquarters of Vectren and regional energy-related facilities such as Babcock & Wilcox's Nuclear Operations Group, coal mines, Global Blade Technology, several large ethanol and biofuel facilities, and a network of gas and oil pipelines. The city of Evansville offers a tax structure for companies locating inside the Evansville Urban Enterprise Zone. Established in 1984 as one of five enterprise zones in the State of Indiana, the 2.1-square-mile (5.4 km2) Evansville Urban Enterprise Zone offers inventory tax credits and other tax credits to eligible businesses. Historic Bosse Field, a 7,180-seat baseball stadium in Garvin Park, was built in 1915 and is the third-oldest ballpark still in regular use in the United States. It is surpassed only by Fenway Park (1912) in Boston and Wrigley Field (1914) in Chicago. The Ford Center is a multi-use indoor arena downtown with a maximum seating capacity of 11,000 connected via Sky Bridge to the Evansville DoubleTree Hotel. It officially opened in 2011 and is used mainly for basketball, ice hockey, and music concerts. The University of Evansville maintains a theater program, which features four mainstage and two studio productions a year. The University of Evansville has been honored more times at The Kennedy Center than any other theatre institution. The University is the only institution, along with Yale, which has been asked to perform at the Kennedy Center without first going through competition. It leads the nation in the top awards for its students as awarded by The Broadway Theatre Wing and other governing bodies of serious theatre. The Evansville Civic Theatre is Southern Indiana's longest-running community theater, dating from the 1920s when the community theater movement swept across the country. 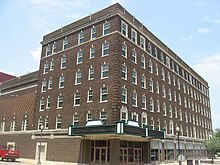 From its humble beginnings at the old Central High School auditorium, Evansville Civic Theatre has had many homes – Soldiers and Sailors Memorial Coliseum, Bosse High School, the Rose Room of the McCurdy Hotel, the Elks Ballroom, and the Evansville Museum of Arts and Sciences. In 1974, Evansville Civic Theatre acquired the historic Columbia Movie Theater as its permanent home. The West Side Nut Club Fall Festival is a street fair held in the area west of downtown Evansville. It is held on the first full week of October and draws between 100,000 and 150,000 people each day. The main attraction of the festival is the food, with offerings of standards like elephant ears and corn dogs to the more unusual, such as chocolate-covered crickets, brain sandwiches, and alligator stew. Paul Harvey once remarked only Mardi Gras in New Orleans is larger than the Fall Festival. Each June the city plays host to the annual ShrinersFest. Frequently the United States Navy's Blue Angels have been an attraction at this event, along with the Canadian Forces Snowbirds. Previously, from 1979 to 2009, Evansville hosted Thunder on the Ohio as part of the Freedom Festival, which was a hydroplane boat race in the H1 Unlimited season. The Germania Männerchor Volksfest is a three-day German heritage festival which takes place every August in the historic Germania Mannerchor building on the city's west side. The festival includes food, drink, dance, and music. Many of the city's residents with German ancestry also wear historic German attire. On the last weekend of August, the popular 4,000 street rods converge on the Vanderburgh County 4-H fairgrounds north of the city for "Frog Follies." The historic Reitz Home Museum. The Evansville African American Museum was established to continually develop a resource and cultural center to collect, preserve, and educate the public on the history and traditions of African American families, organizations, and communities. The museum is in the last remaining building of Lincoln Gardens, the second Federal Housing Project created under the administration of Franklin D. Roosevelt’s New Deal in 1938. The Evansville Museum of Arts, History, and Science is home to one of southern Indiana's most established and significant cultural centers. It holds the Koch Planetarium, the oldest in Indiana. Also on the campus is the Evansville Museum Transportation Center, which features transportation in southern Indiana from the latter part of the nineteenth century through the mid-twentieth century. The Evansville Wartime Museum was opened on the weekend of Memorial Day in 2017. The Museum features exhibits commemorating Evansville's role in the Allied war effort during World War II. The Mesker Park Zoo & Botanic Garden opened in 1928 and is one of the oldest and largest zoos in the state. Set in a 50-acre (200,000 m2) park, the zoo features 200 species and more than 700 animals. An estimated 3 million people visit the zoo between April and August every year. Mesker Park Zoo is accredited by the Association of Zoos and Aquariums. Evansville has a number of notable professional athletes coming from the city. High school athletics are a frequent source of local patronage, and the University of Evansville (UE) and University of Southern Indiana (USI) regularly draw thousands of spectators to NCAA Division I and Division II sporting events, respectively. The UE Purple Aces basketball team plays at the Ford Center. USI plays on campus at the USI Physical Activities Center. Evansville is home to several semi-professional and professional teams as well. The Evansville Otters are a professional baseball team in the Frontier League and have played at Bosse Field since 1995. The Evansville Thunderbolts are a minor league professional ice hockey team in the Southern Professional Hockey League and play at the Ford Center. There is also a junior hockey team named the Evansville Jr. Thunderbolts in the NA3HL and play at the Swonder Ice Arena. The Evansville Coliseum is home to the WFTDA league, the Demolition City Roller Derby. From 1957 to 1975, and then again in 2002 and 2014, Evansville hosted the NCAA Men's Division II Basketball Championship (Elite Eight). From 1999 to 2007, Roberts Stadium hosted the Great Lakes Valley Conference basketball tournaments, and in 2013 the same event was held at the Ford Center. A number of Division I NCAA events have been hosted by the city as well. In 1983 Roberts Stadium hosted the first round of the NCAA Men's Division I Basketball Championship, and in 1980 and 1983 it hosted the Midwestern City Conference men's basketball conference tournament. 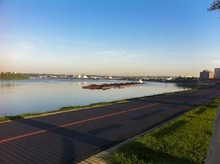 Evansville used to play host to the top tier boat racing circuit of H1 Unlimited when it hosted Thunder on the Ohio along the Ohio River in downtown Evansville, which was hosted continuously from 1979 to 2009. Evansville had also previously hosted Thunder on the Ohio from 1938 to 1940. The 2 mile Evansville tri-oval was known as one of the fastest hydroplane courses in the world, as various world records were set on the Evansville course. Hydroplane racing returned to Evansville in 2017, with the introduction of the Evansville Hydrofest, an American Power Boat Association event. The Goebel Soccer Complex is on 70 acres (280,000 m2) of land and features nine Olympic-size irrigated Bermuda grass fields and one Olympic-size AstroPlay turf field. Additionally, EVSC Fields provide twin soccer fields and stadium seating for the high school regular season and postseason matches. Swonder Ice Arena is a double-rink facility that opened in the fall of 2002 and features a fitness center, a skate park, and party rooms. The schools of the Evansville Vanderburgh School Corporation use. Lloyd Pool for all of their swimming and diving meets in the Southern Indiana Athletic Conference. Evansville has hosted Drums on the Ohio, a Drum Corps International Summer tour competition at the Reitz Bowl, since 1978 with a brief hiatus from 2008-2013. The event normally takes place in June, and draws over 3,000 spectators. It is the only DCI event within a 100 mile radius. Wesselman Woods Nature Preserve is a National Natural Landmark with nearly 200 acres (0.8 km2) of virgin bottomland hardwood forest. It is the largest tract of virgin forest inside any city limits within the United States. The Nature Center features exhibits, events, wildlife observation areas, meeting rooms, library, and gift shop. Adjacent to the Nature Preserve, Wesselman Park features a Par 3 golf course, basketball courts, tennis courts, sand volleyball courts, softball fields, and a playground; and Roberts Park is a proposed, adjacent park on the former site of Roberts Stadium, though funding for Roberts Park and an expansion to the parks system remains unresolved. Evansville has a municipal park system with 65 parks and 21 special facilities encompassing more than 2,300 acres (9 km2) of land in the city of Evansville and Vanderburgh County. A bicycle and pedestrian trail extend into adjacent counties and ties into the American Discovery Trail. This trail system includes the Pigeon Creek Greenway Passage, a 6.75-mile bicycle and pedestrian trail. Access to the completed portions of the trail are found at Garvin Park (N. Main Street and Heidelbach Ave.) and at the downtown Riverfront. The city's parks department also operates two Par 4 18-hole public golf courses, 1 Par 3 18-hole course, one Par 4 9-hole golf course, two disc golf courses, Garvin Park, Lloyd Pool, the Goebel Soccer Complex, Swonder Ice Arena and the C.K. Newsome Community Center. Anchored by the Four Freedoms Monument and the Tropicana Evansville, Dress Plaza along the riverfront offers a brick paved walkway above, and tiered seating below provide a view of the Ohio River. Driving access to parking is available along the lower plaza that is the scene for numerous summer concerts and festivals. Located on nearly 200 acres (0.8 km2) of rolling hills in western Vanderburgh County well outside of the city limits, Burdette Park features an aquatic center with water slides, three pools, and a snack bar. It also offers a BMX racing track, batting cages, softball diamonds, miniature golf, tennis courts, and locations for fishing. Burdette Park is connected to the University of Southern Indiana campus by means of the USI-Burdette Trail, a 3 mile paved, public-use bicycle and pedestrian trail with trailheads at Burdette Park's Discovery Lodge and University of Southern Indiana. The Evansville Courier & Press, owned by Gannett, serves the Evansville area. The newspaper also publishes the monthly magazines Evansville Business Journal and eWoman Magazine, and it owns the Henderson Gleaner in neighboring Henderson, Kentucky. Evansville Living and Evansville Business, published locally by Tucker Publishing Group, are bi-monthly local magazines showcasing the people, businesses, and communities in the area. Other media publications include Maturity Journal, a free monthly newspaper aimed at senior citizens, and News4U, a free monthly entertainment magazine. The Evansville area is primarily serviced by radio stations in Indiana and Kentucky. The two main radio groups in Evansville that control the majority of its radio stations are Townsquare Media and Midwest Communications. Radio stations providing coverage to Evansville include: WSWI/820, WGBF/1280, WBGW/1330, WEOA/1400, WABX/107.5, WDKS/106.1, WJPS/107.1, WGBF-FM/103.1, WIKY-FM/104.1, WJLT/105.3, WKDQ/99.5, WLYD/93.5, WNIN-FM/88.3, WSTO/96.1, WBKR/92.5 WUEV/91.5 and WPSR/90.7. Evansville is, as of the 2015-16 rankings, the 103rd-largest television market in the United States according to Nielsen Media Research. The designated market area consists of 30 counties in Southeastern Illinois, Southwestern Indiana, and Northwestern Kentucky. The 2010 population estimate of this 30-county region is nearly one million people. The Mayor of Evansville, Lloyd Winnecke, serves as the chief executive officer. Cities in Indiana have a Mayor–council government, or strong mayor system, so the mayor has most of the executive and administrative power over the city’s daily operations. A nine-member elected City Council is the legislative and fiscal body of city government. The Council’s nine members are made up of one representative from each of the City’s six Council districts and three at-large members. Members are part-time elected officials who serve for four-year terms. As the legislative body, the Council has the exclusive responsibility of passing or changing local laws. As the fiscal body, the Council has the authority to levy certain taxes and it has the sole responsibility of adopting a City budget each year. † Hayden was appointed by caucus in 2017 to complete an unfinished term vacated by Anna Hargis. The Evansville Police Department, founded in 1863, is the city's law enforcement agency. Prior to that, law enforcement was the responsibility of the Warrick County sheriff (1818 to 1847) and the city marshal (1847 to 1863). From 1863 to 1883, the city marshal shared policing duties with the police department. The current chief of police Billy Bolin. The county has eight state trial courts of original jurisdiction. One circuit court and seven superior courts. The judge's offices are non-partisan in terms of six years. A judge must be a member of the Indiana Bar Association. The judges are assisted by magistrates that are appointed. circuit court. The United States District Court for the Southern District of Indiana maintains a permanent division in the city. The region is in the 8th District of Indiana and served by U.S. Representative Larry Bucshon. Evansville is the county seat of Vanderburgh County. Some of the city's governmental functions are shared with Vanderburgh County officials. In recent years various bi-partisan groups have advocated merging the Evansville city and Vanderburgh County governments, as was done in other surrounding cities such as Indianapolis, Louisville, and Nashville. Evansville and Vanderburgh County already have a number of notable merged government functions. The school system is consolidated countywide in the Evansville Vanderburgh School Corporation and the library system is consolidated countywide in the Evansville Vanderburgh Public Library. Additional countywide authorities are in place for the Evansville Regional Airport and for flood control via the countywide levee authority. The University of Southern Indiana (USI) is a public university just outside Evansville city limits. Founded in 1965, the school has an enrollment of over 10,800 students and is among the fastest growing comprehensive state universities in Indiana. USI athletic teams participate in Division II of the NCAA and are known as the Screaming Eagles. USI is a member of the Great Lakes Valley Conference. The Indiana University School of Medicine - Evansville is currently housed on USI's campus, but there are plans to locate a new interdisciplinary academic health science education and research campus downtown. Other campuses in the city include Ivy Tech Community College, Harrison College, and Oakland City University's School of Adult and Extended Learning. Evansville has one unified school system with the county, the Evansville Vanderburgh School Corporation (EVSC). It consists of five public high schools, 11 middle schools, and 20 elementary schools. In addition, there are two parochial, two charter, and one private school. Evansville is home to the Evansville Vanderburgh Public Library (EVPL). As a unified system serving both Evansville and the surrounding county, EVPL is one of the largest public library systems in Indiana. It was rated a five star library by the Library Journal, which places it in the top 1% of public libraries in the U.S. EVPL also obtained a Top Ten library ranking in the 2010 edition of Hennen's American Public Library Ratings, achieving a number eight ranking within its population category. An independent private institution, Willard Library, is also in Evansville. Willard was formed in 1881 to serve the public, regardless of race, a progressive mission in the latter half of the nineteenth century. The library houses local archives and genealogical materials, in addition to its collection of standard publications. The building is constructed in the Gothic Revival style and was listed on the National Register of Historic Places in 1972. Southern Indiana Japanese School (SJIS; 南インディアナ補習授業校 Minami Indiana Hoshū Jugyō Kō), a weekend Japanese school, has its offices and classrooms at Nativity Church in Evansville. Founded on September 16, 1997, it has 11 teachers and 53 students as of April 2014. Immediate access to many major forms of transportation makes Evansville an important factor in Indiana's global economy. The city boasts road, rail, water, and air transportation systems. The Evansville Regional Airport, housed in a 140,000-square-foot (13,000 m2) terminal, offers over 30 flights a day to destinations around the country. Evansville does not have access to commuter rail. Evansville has a growing interstate system. I-64 is eight miles north of the city and straddles the Gibson - Vanderburgh County line. This interstate routes west to St. Louis and runs east to Louisville. I-69 provides a convenient link from I-64 to the city's thriving eastside retail district and a direct route to the downtown business district via the Veterans Memorial Parkway. It extends north to Martinsville, IN where it officially ends, but plans are in the works to extend it to Indianapolis. U.S. Highway 41 connects the city with Henderson to the south and, to the north, the cities of Princeton, Vincennes, and Terre Haute. Other major local state roads include State Road 57, State Road 62 (Morgan Avenue / Lloyd Expressway), and State Road 66 (Lloyd Expressway / Diamond Avenue). Electricity and natural gas are both provided to Evansville by Vectren, a monopoly in the area. Water and sewer services are provided by the Evansville Water & Sewer Utility, which provides water to more than 75,000 customers in Evansville and the surrounding area. The Ohio River provides for most of the city's source of drinking water. Water is drawn from the river and filtered at a 60 million gallon per day treatment plant. There are approximately 1,000 miles of water mains in the system and includes approximately 6,000 fire hydrants. Game scenes in the 1992 film A League of Their Own were filmed at Bosse Field. It is the third oldest baseball stadium still in use in the United States (behind Fenway Park in Boston and Wrigley Field in Chicago). The ballpark served as the homefield for the Racine Belles. Scenes from the 2014 Michael Rosenbaum movie Back in the Day feature Green River Road in Evansville. All exterior shots on the 1988-1997 sitcom Roseanne are still photographs taken in and around Evansville. The Connors' house is at 619 South Runnymeade Avenue, and the Lobo Lounge is a pizzeria at the corner of Edgar and Louisiana Streets. Matt Williams, one of the show's producers, is a native of Evansville and a graduate of The University of Evansville theatre program. He is a co-founder of Wind Dancer Productions and has been involved with numerous sitcoms such as 'Home Improvement', movies and dramatic plays for Broadway. The Daily Show has featured Evansville in two episodes. The first featured a story about comedian Carrot Top's reopening of the historic Victory Theatre. The second poked fun at former mayor Russel Lloyd Jr. for skipping out on a city meeting to attend Cher's Farewell Tour concert being performed on the same night at Roberts Stadium. Evansville was also featured in Alton Brown's series Feasting on Asphalt. Alton and his crew visited the historic Greyhound Bus station for its vending machines, the YWCA tea room for lunch, and the Hilltop Inn for a brain sandwich and burgoo. Other shows have included Ghost Hunters which investigated Willard Library's "Gray Lady" ghost and Storm Stories on The Weather Channel documenting the devastating tornado that struck the city in 2005. The city was briefly featured in the 2007 Prison Break episode "Chicago". In 2012, Evansville was featured on the British television program Supersize vs Superskinny because of a poll that ranked the residents of the city as the most obese in the United States. Evansville and neighboring Newburgh was the featured location for the feature film "Back in the Day" filmed in 2014. Evansville is mentioned several times in the third and fourth seasons of the HBO series Boardwalk Empire. An Evansville couple is the focus of "Hungarian Rhapsody: An Adoption Story" by James Derk, based on a series of stories in the Evansville Courier & Press. ^ Snowfall and snow depth records only date to 1 January 1948. ^ "US Board on Geographic Names". United States Geological Survey. October 25, 2007. Retrieved 2016-07-18. ^ "Statewide Campuses". Retrieved 2019-01-14. ^ "2008 Best Cities". Kiplinger. Retrieved 2010-01-30. ^ "The top 25 cities according to Kiplinger.com visitors". Kiplinger. Archived from the original on 2010-01-17. Retrieved 2010-01-30. ^ "ANGEL MOUNDS". Friends of Angel Mounds. Retrieved 27 August 2017. ^ Patry, R. (1996). City of the Four fFeedoms. Robert Patry and friends of Willard Library. pp. 11–15. ^ "Population of the 100 Largest Urban Places: 1890". U.S. Bureau of the Census. Archived from the original on 2006-04-24. Retrieved 2006-05-02. ^ "Truck museum photos including a 1927 Graham". ^ Lucas, John (2006-10-16). "Airplanes, especially P-47s, are city man's passion". Evansville Courier & Press. Retrieved 2007-06-03. ^ Patry, Robert (1996). City of Four Freedoms. Evansville: Friends of Willard Library. p. 35. 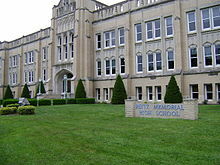 ^ "Reitz Home Museum". The Reitz Home Preservation Society. Archived from the original on 2007-06-25. Retrieved 2007-05-18. ^ a b c d e f "NowData – NOAA Online Weather Data". National Oceanic and Atmospheric Administration. Retrieved 2017-08-29. ^ "University of Evansville Fact Sheet". Archived from the original on 2006-10-11. Retrieved 2006-11-14. ^ Service, US Department of Commerce, NOAA, National Weather. "Paducah, KY". Crh.noaa.gov. Retrieved 27 August 2017. ^ "Station Name: IN EVANSVILLE REGIONAL AP". National Oceanic and Atmospheric Administration. Retrieved 2014-03-26. ^ "WMO Climate Normals for EVANSVILLE/REGIONAL, IN 1961–1990". National Oceanic and Atmospheric Administration. Retrieved 2014-03-11. ^ "Winnecke to ORSANCO: Dropping Ohio River standards could be 'negative game changer'". Evansville Courier & Press. Retrieved 2018-09-14. ^ Lake, Adams. "Angling Indiana - Fish Consumption Advisory": 27. ^ "Super polluters tour gives people close up look at where Hoosiers get their power". Evansville Courier & Press. Retrieved 2018-09-14. ^ "Meet America's super polluters". USA Today. Retrieved 2018-09-14. ^ "Population Estimates". United States Census Bureau. Archived from the original on 2014-05-22. Retrieved 2014-10-21. ^ "Major Employers - Southwest Indiana Economic Development Coalition". Southwestindiana.org. Retrieved 27 August 2017. ^ "Major Employers in Southwest Indiana". Retrieved 5 March 2012. ^ "Economic Strength Rankings 2007" (PDF). POLICOM Corporation. Archived from the original (PDF) on 2007-11-28. Retrieved 2007-11-19. ^ "Project Green". Project GREEN. Archived from the original on 26 March 2012. Retrieved 20 March 2012. ^ "In the Zone: A Look at Indiana's Enterprise Zones". Indiana Business Review. Retrieved 2009-10-30. ^ "Evansville Arena Facts" (PDF). Populous. Archived from the original (PDF) on July 23, 2011. Retrieved September 9, 2009. ^ "The Centre". SMG Evansville. Archived from the original on 2006-10-28. Retrieved 2006-11-02. ^ "The Victory Theatre". SMG Evansville. Archived from the original on 2006-10-28. Retrieved 2006-11-02. ^ "Evansville Philharmonic Orchestra Website". Retrieved 2006-11-02. ^ "University of Evansville Department of Theatre Website". Retrieved 2009-11-22. ^ "Evansville Civic Theatre Website". Archived from the original on 2007-02-03. Retrieved 2006-12-09. ^ Davis, Rich (2006-10-01). "Fall Festival brings years of traditions, changes to streets of Evansville's West Side". Evansville Courier & Press. Retrieved 2006-11-04. ^ "Evansville Freedom Festival Website". Retrieved 2006-11-04. ^ "Frog Follies Website". Retrieved 2006-11-04. ^ "Angel Mounds State Historic Site". Evansville Convention & Visitors Bureau. Archived from the original on 2006-10-06. Retrieved 2006-11-14. ^ "Koch Family Children's Museum of Evansville Website". Retrieved 2006-11-14. ^ "The Koch Planetarium". The Evansville Museum of Arts, History, and Science. Archived from the original on 2007-02-10. Retrieved 2006-11-14. ^ "LST 325". Evansville Courier & Press. Archived from the original on 2006-10-29. Retrieved 2006-11-14. ^ Loesch, Sarah. "Evansville Wartime Museum to open for public". Evansville Courier & Press. Archived from the original on 24 May 2017. Retrieved 31 January 2018. ^ "HydroFest boat race called a success, will return in 2018". Evansville Courier & Press. 27 September 2017. ^ "About Us | DRUMS on the OHIO". DRUMS on the OHIO. Retrieved 2018-05-03. ^ "Wesselman Woods". Letterboxing North America. Retrieved 2006-11-14. ^ "Evansville Business News, Articles and Events - Evansville Business Magazine". www.evansvillebusiness.com. ^ "Brands - Local Radio Stations & Clusters - Townsquare Media". Townsquare Media - Digital Media & Radio Advertising Company. Retrieved 27 August 2017. ^ Inc., Midwest Communications. "Midwest Communications, Inc". mwcradio.com. Retrieved 27 August 2017. ^ "Indiana Radio Stations - Indiana Radio Station List". Usnpl.com. Retrieved 27 August 2017. ^ "Radio Stations in Evansville, Indiana". Radio-locator.com. Retrieved 27 August 2017. ^ "Nielsen Media 2010-2011 Local Market Estimates". Nielsen Media 2010-2011 Local Market Estimates. TVJobs.com. Archived from the original on 2008-08-28. Retrieved 20 May 2011. ^ a b "Council Leadership". Tristate Homepage. Retrieved 10 January 2018. ^ "Early EPD History". Evansville Police Department. Retrieved 6 October 2016. ^ Indiana Code. "Title 2, Article 10, Section 2" (PDF). IN.gov. Retrieved 2008-09-16. ^ "Wayback Machine". 20 November 2005. Archived from the original on 20 November 2005. ^ "Evansville and Vanderburgh County Unification Study". Retrieved 2005-12-02. ^ "University of Southern Indiana". Indiana College Network. Retrieved 2006-12-18. ^ "SICTC at-A-Glance". Southern Indiana Career & Technical Center. Retrieved 2008-09-08. ^ "Evansville Day School - Info". Evansvilledayschool.org. Retrieved 2017-08-28. ^ "Southern Indiana Japanese School" (Archived 2015-04-01 at WebCite). University of Southern Indiana. Retrieved on April 2, 2015. "SIJS is located at Nativity Church, 3635 Pollack Avenue, Evansville." Japanese page (Archive). ^ PDF version (Archived 2015-04-01 at WebCite). University of Southern Indiana. Retrieved on April 2, 2015. ^ "City of Evansville Water Department". Archived from the original on 2012-06-08. Retrieved 2012-02-19. ^ "Hilltop Inn - Evansville, IN - The Manliest Restaurant in America". www.wegotbrains.com. ^ "Fattest city designation lands Evansville on British TV program". Evansville Courier & Press. 2012-01-11. Archived from the original on 2012-01-16. ^ Derk, James (10 October 2006). "Hungarian Rhapsody: An Adoption Story". AuthorHouse. Retrieved 27 August 2017 – via Amazon. ^ "Sister Cities International". Archived from the original on 2006-12-29. Retrieved 2006-11-20.